Restore softness and shine with Paul Mitchell Awapuhi Wild Ginger Styling Treatment Oil; an ultra-lightweight formula that can be applied to dry or damp hair for salon-worthy results. 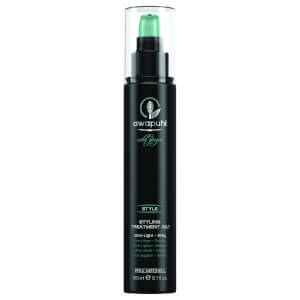 Enriched with Awapuhi Extract, the nourishing oil restores moisture to help quench parched hair in need of hydration. Expect smooth, replenished locks with revived radiance and a frizz-free finish. Infused with a luxurious fragrance that blends notes of tropical Mango, Italian Bergamot and Sicilian Lemon with Green Tea, aromatic Ginger and Jasmine. Water (Eau, Aqua), Hydrofluorocarbon 152a, PVP, Cetearyl Alcohol, Mineral Oil (Paraffinum Liquidum, Huile Minerale), Petrolatum, Behentrimonium Chloride, Behentrimonium Methosulfate, Cetyl Alcohol, Glycerin, Butylene Glycol, Hydrolyzed Wheat Protein, Cetrimonium Chloride, Panthenol, Argania Spinosa (Argan) Kernel Oil, Bisamino PEG/PPG-41/3 Aminoethyl PG-Propyl Dimethicone Hedychium Coronarium, (White Ginger)/PEG-12 Dimethicone, Sea Salt, Citric Acid, Tetrasodium EDTA, Diazolidnyl Urea, Iodopropynyl Butylcarbamate, Fragrance/Parfum, Benzyl Salicylate, Hexyl Cinnamal, Limonene, Linalool.